There are many so called experts out there that will tell you to apply varnish on your outdoor teak furniture to preserve the original color of the wood. They may claim it will “last” longer and protect the wood better. These statements are simply not true. Varnish is an out dated way to protect your outdoor teak wood from the elements. For years it was the only product on the market to maintain the original color of your teak. The most popular applications for varnish were used on the trim of boats. This is where it gained it reputation from. What most people may not know about the application of varnish on boats is that there are large amounts of constant maintenance. Many boat owners would re-apply the varnish on a monthly basis basically becoming a “teak slave”. If the maintenance schedule was not kept up on a regular basis then the varnish would start to blister and peel. 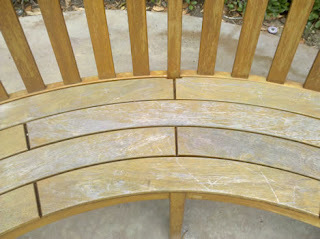 If this happened the wood would have to be stripped, re-stained, and reapplied. Yes teak is still used on new boats and yes varnish is still applied to the teak but the extreme maintenance remains the same. What is the old saying about buying a boat? “The greatest joy comes when you buy the boat and when you sell it”. The reasons why you should never use varnish on teak furniture is that it will peel, blister, and turn yellowish in color. The VOC’s (volatile organic compounds) have been lowered in many states to almost zero because of air pollution restrictions. This is a key factor to the longevity of a product. Compared to teak trim on a boat, outdoor teak furniture is pretty intricate. There are vertical and horizontal surfaces along with slats and carvings to deal with. Imagine applying varnish to 30 intricate pieces of teak furniture and it starts to blister and peel. It would take a great deal of time, energy, and money to fix the problem. Another reason not to use varnish is that it is not easy to apply on intricate teak furniture. Varnish is thick and sticky and will need to be reduced to be applied by a brush. The dry time is usually 24 hours or more depending on the climate and thickness of application and needs many coats for maximum protection according to most manufacturers. Varnish is a glossy finish even in matte and is usually not a desired aesthetic in modern design. One may say it gives the furniture the “Ikea” look. Another option is to spray the varnish which needs to be done by a professional finisher and is expensive. There is an effective way to maintain your outdoor teak furniture without becoming a “teak slave”. A high quality sealer specifically for hardwoods is the best way to maintain your outdoor teak furniture. Sealers are relatively easy to apply and sometimes come in different shades. Sealers allow owners to maintain their furniture with relative ease. In most cases the furniture can be wiped down and cleaned and the sealer can be reapplied every 6 to 12 months. All of the talk of varnish and peeling may leave you discouraged but there is still another alternative to all of the varnish madness. A professional refinishing company out of Los Angeles California that has mastered the art of teak furniture care. Teak Master is a California based company that offers a wide range services to care for and provide information about maintaining outdoor teak furniture. They have a very informative website that will guide you through the process of teak restoration or performing teak restoration laguna beach. They also provide free information on how to seal and maintain your teak furniture yourself. Weather you seal your teak furniture yourself or have it sealed professionally please enjoy it without becoming a “teak slave”. That's a good suggestion. I am a teak lover myself, but I will never succumb to being a "teak slave." I find your tip about using other materials very useful. It might be more expensive, but it does require less maintenance. Teak does not need to be protected. It is a unique wood that if left in its natural state, is virtually maintenance-free. Teak can be left outside year round, surviving even the most extreme weather conditions. 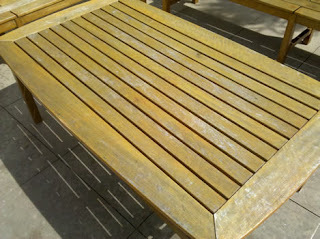 Varnish is an out dated way to protect your outdoor teak wood from the elements. Thanks. Whoa, I think I love teak outdoor furniture even more now, seeing as how maintenance-free it is! Good post! I love this bench! It's so cute, and I love how unique it is. The seat is so cool, I love the look of the design of the wood. This would look perfect in my backyard! The work was ABSOLUTELY BETTER THAN I EXPECTED!!!! I will prescribe him to any hoping to redo any old furniture. My sister and I had this beige awesome calfskin love seat that my grandparents had deserted that we couldn't settle to dispose of on the grounds that it's so comfortable! It watched super exhausted and had a few tears from my puppy always bouncing up on it. I found out about the wonderful work Semi-circular Shaped lounge Stain Cleaning Canberra did on my companions old lounge chair so I chose to call them. Great costs and they were so speedy. The lounge chair has never looked better as well! Presently I don't have to go spend a fortune on purchasing another love seat. I m a dog sweetheart and I have a pomellian puppy which is extremely underhanded and hop again n again on my leather seat which was skilled by my closest companion. Subsequently, it got stains and possess a scent reminiscent of my Bruno which leaves a terrible impact on my visitor. Along these lines, to defeat this issue I enlist Semi-circular shaped lounge stain Canberra Who have a group of professionally gifted specialists, went to my home and clean my lounge chair. Presently my love seat looks as I recently got it.Much appreciated to Capital Upholstery Cleaning Canberra. I had a lounge chair set that I bought most recent 5 months prior and is exceptionally costly. I have two children. One of my children is extremely lethargic. He is sitting on the couch and eating a burger and all of a sudden I don't recognize what he did, He through the burger on the sofa and I was stunned in light of the fact that it got a major stain which I endeavor to evacuate however not ready to expel it. In this manner I hire Steam clean dining chair Cleaning Canberra to clean my lounge chair. They went to my home and clean my love seat and discharge me from an overwhelming pressure. Because of ALL THE GUYS WHO COME TO MY HOUSE AND RESOLVE MY PROBLEM...I HIGHLY RECOMMEND TO HIRE THEIR SERVICE FOR CLEANING OF ALL TYPE OF UPHOLSTERY. 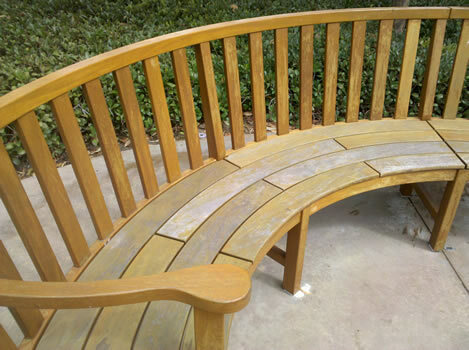 If you are looking for Teak furniture refinish services in Laguna Nigue, CA, United States. Then visit the mentioned website.